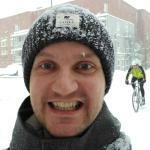 I'm a bioinformatician in Stockholm, and this is my personnal site. The owl is the symbol of Athena or Minerva. Athena who protected Ulysses during his journey. This owl is made from an idea I had, magnified and drawn by Célia. Then later vectorized via Inkscape by my own hands.